Yahweh, I come before you in prayer, to magnify and glorify your precious name. Draw close to me, Oh heavenly Father. Lead me, guide me, walk beside me. Shape me into who You want me to be. Allow Your will to be done in my life in order for me to become a living, breathing testimony. Take control, Oh Lord, Jesus, be the centre. Fill me with Your Holy Spirit, Lord. Allow me to display self-control when temptations draw near. 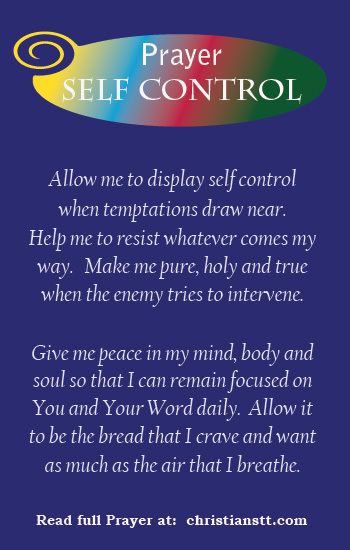 Help me to resist whatever comes my way. Make me pure, holy and true when Lucifer tries to intervene. Give me peace in my mind, body and soul so that I can remain focused on You and Your word daily. Let your Word be the bread that I crave and want as much as the air that I breathe. Galatians 5:16-18 I say then: Walk in the Spirit, and you shall not fulfill the lust of the flesh. For the flesh lusts against the Spirit, and the Spirit against the flesh; and these are contrary to one another, so that you do not do the things that you wish. But if you are led by the Spirit, you are not under the law. Let lustful desires, anger, guilt, jealousy, sorrow and pride just fall away at the sound of Your great name. May these things not control my actions, my emotions or even my thoughts. Oh Lord, I continually desire to seek You. Give me the strength to overcome. Without you, I cannot go on, I need You, Oh loving Father. I declare and decree that temptations will not get the better of me, in Jesus’ mighty name, Amen.